Description : MeetMoi has developed a service that allows you to identify your location from your cell phones and determine whether there are any other people whose profiles meet your search criteria and are within a certain specified distance of you. 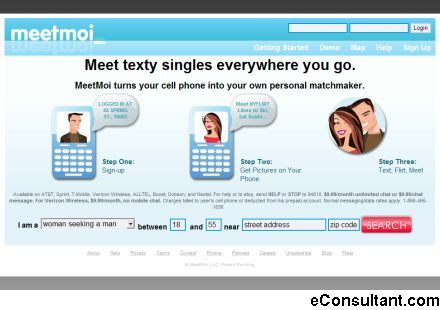 If MeetMoi finds a match, they will send you the person’s or persons profiles via SMS. If you like what you see, you can text message the person you like anonymously and eventually arrange a meeting.